Cotton (Gossypium hirsutum L.) plants were grown in flowing-culture solutions containing 0%, 26% and 55% natural seawater under controlled and otherwise identical conditions. Leaf Na+ content rose to 360 mM in 55% seawater, yet the K+ content was maintained above 100 mM. The K+/Na+ selectivity ratio was much greater in the saline plants than in the control plants. All plants were healthy and able to complete the life cycle but relative growth rate fell by 46% in 26% seawater and by 83% in 55% seawater. Much of this reduction in growth was caused by a decreased allocation of carbon to leaf growth versus root growth. The ratio of leaf area/plant dry weight fell by 32% in 26% seawater and by 50% in 55 % seawater while the rate of carbon gain per unit leaf area fell by only 20% in 26% seawater and by as much as 66% in 55% seawater. Partial stomatal closure accounted for nearly all of the fall in the photosynthesis rate in 26% seawater but in 55% seawater much of the fall also can be attributed to non-stomatal factors. As a result of the greater effect of salinity on stomatal conductance than on CO2-uptake rate, photosynthetic water-use efficiency was markedly improved by salinity. This was also confirmed by stablecarbon-isotope analyses of leaf sugar and of leaf cellulose and starch. — Although non-stomatal photosynthetic capacity at the growth light was reduced by as much as 42% in 55% seawater, no effects were detected on the intrinsic photon yield of photosynthesis nor on the efficiency of photosystem II photochemistry, chlorophyll a/b ratio, carotenoid composition or the operation of the xanthophyll cycle. 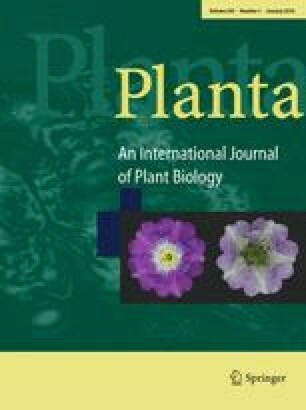 Whereas salinity caused in increase in mesophyll thickness and content of chloroplast pigments it caused a decrease in total leaf nitrogen content. The results indicate that the salinity-induced reduction in non-stomatal photosynthetic capacity was not caused by any detrimental effect on the photosynthetic apparatus but reflects a decreased allocation to enzymes of carbon fixation. — Rates of energy dissipation via CO2 fixation and photorespiration, calculated from gas-exchange measurements, were insufficient to balance the rate of light-energy absorption at the growth light. Salinity therefore would have been expected to cause the excess excitation energy to rise, leading to an increased nonradiative dissipation in the pigment bed and resulting increases in non-photochemical fluorescence quenching and zeaxanthin formation. However, no such changes could be detected, implying that salinity may have increased energy dissipation via a yet unidentified energy-consuming process. This lack of a response to salinity stress is in contrast to the responses elicited by short-term water stress which caused strong non-photochemical quenching and massive zeaxanthin formation. We thank Connie Shih for skilful assistance in growing plants and for conducting HPLC analyses and Barbara Mortimer for conducting the nitrogen analyses. Thanks are also due to C. Barry Osmond (now, Australian National University, Research School of Biological Sciences, Canberra) and Larry Giles of the Department of Botany, Duke University, Durham, N.C., for conducting carbonisotope analysis. E.B. was partially supported by the National Research Council of Italy, Special Project RAISA, Sub-Project No. 2. A Carnegie Institution Fellowship to E.B. is also gratefully acknowledged. This work was supported by grant No. 89-37-280-4902 of the Competitive Grant Program of the U.S. Department of Agriculture to O.B.